← Understanding Flying Corvairs Pt. #8, Learning from other’s mistakes. Five years ago today I wrote a story about a single hour that had passed the day before at our airport. Most hours go by in your life with little or no memory, others stay with you vividly. I would remember this hour well, even if I had not written it down in the story. Today, 5 years later, a handful of photos of the people from the story. I consider myself lucky to know them. I am 51 now, and have spent 26 years in aviation, literally half my life. It is enough experience to say that the humans you meet at airports can be a lot more alive than the people you meet on the street. All my life I have been plagued by the feeling that time passes too quickly. Although we have done a lot in the last four years, it isn’t enough, and the thought that the hours and days got away bothers me. Yet, one hour, five years ago, will never slip from my grasp. I get to keep it, and herein lies the secret of my happiness: fill the hours with quality and they will not get away. I can not remember what I ate for breakfast yesterday, but I can remember that the tug boat captains shirt was blue and he waved a white hat as we passed 100 feet above the Tennessee river in our Pietenpol on the way to Oshkosh 2000. 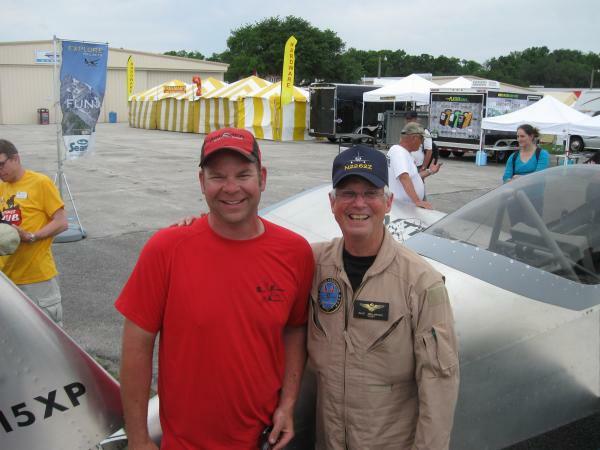 Above, Dan Weseman and Dave Dollarhide at Sun n Fun 2013. They are both in the story “Friday Night.” Dave is fairly well known in Naval Aviation circles because of a short film clip of a young pilot escaping from an A-4 in the USS Forrestal inferno. In one of those stories that only happens in aviation, Dave is now flying one of the very few remaining airworthy A-4′s… 45 years later.